Not as cheap as I thought it would be, but in its attempt to cash in on the sickness that is the crossover craze, this sub XT5 model tries to win over young buyers (which it wont. Crossovers mainly attract older over 50 people) with style? Sure. Here’s the price break down. At this trim, the silver seen above, is the only color option you wont be charged for. There are 7 other color choices. 5 are $695. The last 2, both tri coats of red or crystal white, are both $1,225. 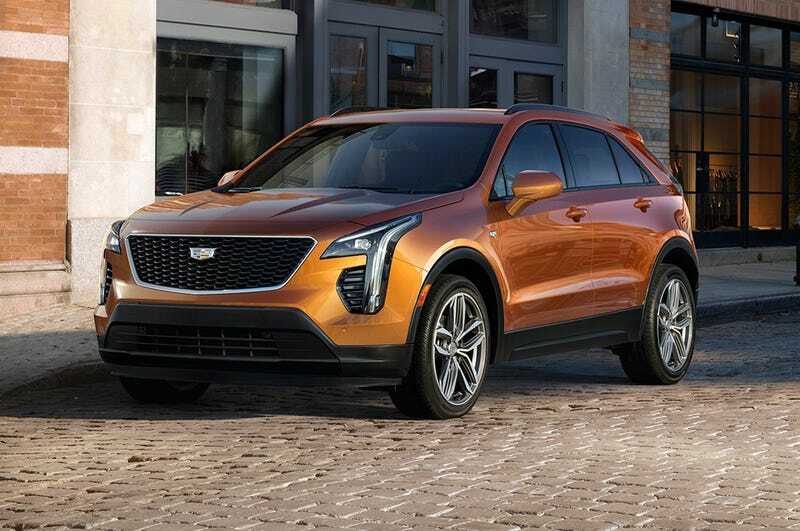 I choose the orange that Cadillac released the car in which they call Autumn Metallic. Interior color choices at this trim are limited to just black leatherette. $35 grand and cant get real leather. But anyway.. There are 3 option packages for the Luxury trim which all either are pointless or necessary if you live in a certain part of the country, or appeal to the AARP crowd that will go for these:a Cold weather package for $850 that comes with heated front and rear seats and a heated steering wheel; a trialing package for $300, and a battery protection package that they leave up to the dealer to set pricing for. I selected none of these though on our surprisingly cold winter mornings, those heated seats would help. The basic-ness of this trim continues to the exterior where there are no wheel choices but the ones pictured above. There’s an engine block heater for $100, a front license plate bracket for $15 or a pano roof with front opening and fixed rear skylight for $1700. I added this. For some reason, and I think its more aesthetics because the XT4 would look weird without them, you have to get satin aluminum roof rails if you add the pano roof. The interior is handsome though the wheel is cheap looking. There’s one main option for the interior and that’s to add CUE with Navigation. But at $1500, you’d have to be a fool to do such a thing with the presence of AppleCar Play and Android Auto make in dash nav a moot point. All the other interior options are accessories like tablet holders and cargo nets. All in for a base XT4 with basic options and no real leather? $38,115 or $40,615 with AWD.$39,615 for fwd if you add the CUE with nav or $42,115 with AWD. Not cheap. The next trim up is Luxury Premium. It starts at $40,290 ($42,790 with AWD). It builds on the base luxury by coming standard with things like real leather (!) seats, front and rear park assist, lane change alert with blind spot detection, rear cross traffic alert, a power litigate and ambient interior lighting. This along with the Cold Weather package totaled the $1900. There’s an Enhanced visibility package that is pretty much a safety suite of assist features for $1500. I added this as well. Adding this required the addition of a Driver Awareness package bringing the total to $2,270. Honestly, at $770, this package, which is just more driver aids, should be in the Enhanced visibility package. Front cornering lamps and led turn signals. I also added the Driver Assist Package which comes with adaptive cruise control and auto braking for $1100. For some reason adding this required the addition of diamond cut 20 in wheels for $2200. Adding the Pano roof you’re looking at $50,485 for this trim. $52,985 with AWD. The only main option differences on the Performance Trim are the 20 in 5 spoke Diamond cut wheels for $1100 and Active Sport Suspension for $1200. With all the same options as the previous trim, a Performance trim XT4 will set you back $52,835; $55,335 with AWD. The XT4 looks to be nice yet another entry into an already crowded market. For the price though, it seems to bring nothing really worth it over competitors to the table. Will it attract buyers interested in GLc/Q3/ etc over? Time will tell. But we do know that it wont be many young buyers they are counting on.